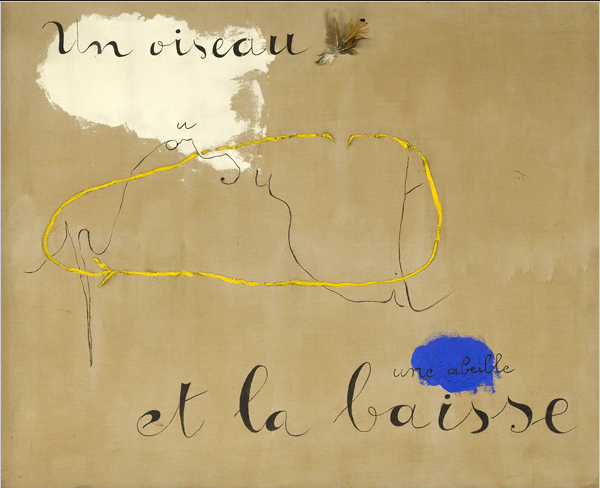 Joan Miró: Painting and Anti-Painting 1927–1937 at MoMA is the first major museum exhibition to display the chronological process of Miró’s practices and ideologies used to attack conventions and disrupt market values in this vital decade. 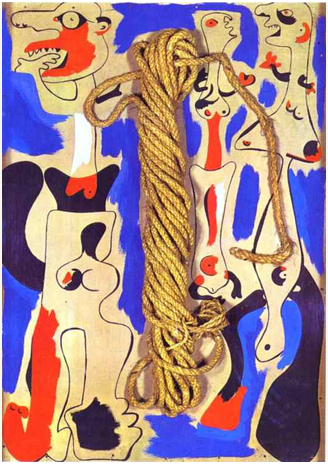 The exhibition uses Miró’s 1927 claim of “wanting to assassinate painting” as its launch point to explore his lineage in 12 groups, which includes 90 paintings, collages, objects, and drawings. 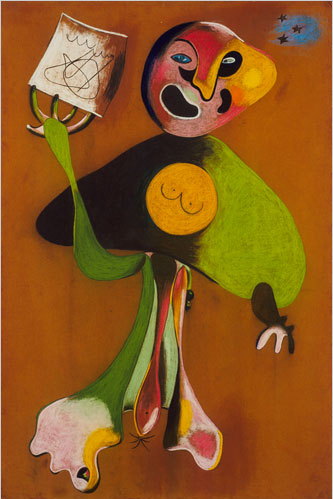 The exhibition takes a step-by-step perspective of the reinvigoration and radicalization of Miró’s sustained series. 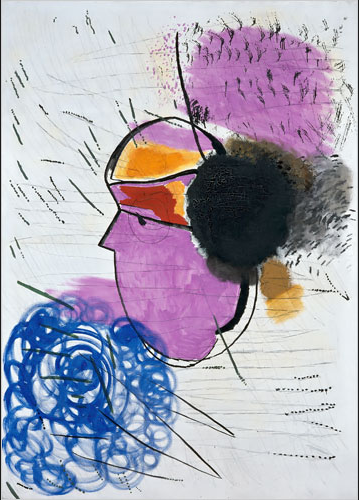 Additionally the exhibition is symptomatic of the European reaction to the end of the roaring twenties and insemination of political tensions that would culminate in 1939. 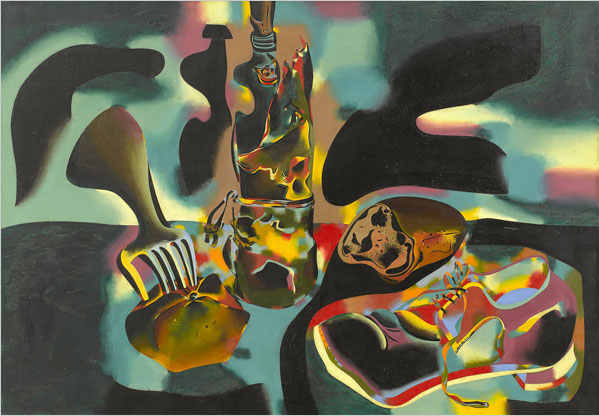 The exhibition begins with a group of works composed on unprimed canvas and concludes with a single painting from 1937: Still Life with Old Shoe and is culmination of works created in Paris, Montroig (a rural village on the coast of Catalonia), and Barcelona. 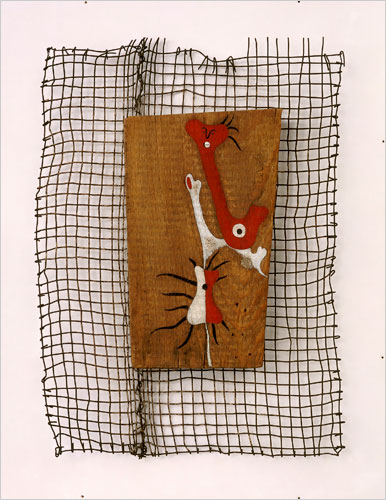 The exhibition is organized by Anne Umland the Curator or the Department of Painting and Sculpture at the The Museum of Modern Art. It will be on view in The Joan and Preston Robert Tisch Gallery, sixth floor, from November 2, 2008, through January 12, 2009. Down on the shop floor, the famous four robots – they trundle around taking orders for components – have fallen silent. The only lights left on are in the research lab, where a dozen engineers are immersed in their work, hunched over circuit boards and oscilloscopes. Incongruous in the corner is an all-black prototype of an Aston Martin DB9, hundreds of fibre optic cables threaded through its open panels. One floor up, in a cavernous room containing little more than the large table and chairs at its centre, Ivor Tiefenbrun is engrossed in a strategy meeting. There are seven men and women sitting around him, all in their thirties and casually dressed. A red-faced man is gesticulating excitedly. Others are interrupting him, laughing. Tiefenbrun is listening, saying little. After an hour the meeting breaks up, and the 57-year-old wanders over, extending a hand and apologising for the delay. This is the man who, in the past 30 years, has built Linn into the world’s greatest hi-fi company – a label bestowed by its peers. As is common among Scottish manufacturers, its reputation for quality is internationally renowned. Tiefenbrun’s success has been hard won. Too hard won. “I’ve put my life into this company,” he says. “But if I had the chance to do it again, I’d say no. “In fact I think I’m going to write a book. I’ll call it Shafted: Being In Business In Scotland.” Tiefenbrun is an outspoken critic of a government and public “who don’t understand and don’t care” about the decline of British manufacturing. He started out as an apprentice with his father’s firm, Precision Engineering, then raised GBP 50,000 in the early 1970s to start his own company. A music fan, he was convinced he could improve on the best record players of the day. Today Linn makes hi-fi for some of the world’s richest individuals and most famous brands. But for all the awards, sales and recognition he has achieved, he’s frustrated by what he sees as a failure to reach the company’s potential. He concedes Linn has clients such as Aston Martin queuing up to do business. “We’re not short of those kinds of opportunities,” he says. “It’s something we don’t brag about because our customers are often very private individuals, and they don’t want people to know they’ve just spent GBP 500,000 on hi-fi for their home. “But what we do for the superyachts market, or the specific product we might make for someone who is blind, or a design for a customer who wants a one-off look or sound, is absolutely critical for our business because we learn from it.” He gives an example. “A few years ago we had a requirement from a customer with an estate [in Italy]. He’d already spent GBP 1 million on a Linn movie theatre and he wanted all his CD music linked up, so he could listen to it in a separate building about two miles away from the main house. “We did that through a fibre optic system across his estate. And what we learned from that we’re now using to do the [Aston Martin] DB9. We’ve got several exciting developments like that on the go. “But business is tough. It’s like pushing water up a hill. We’ve got an ever increasing cost base, the corporate tax regime is iniquitous, and the planning system has crippled us for years. Then there’s about 40,000 pieces of f***ing legislation that have come in under this government, all 40,000 of which are a pain in the f***ing a***. “We’re a success to the extent that others have fallen by the wayside,” he says. “But we haven’t built a major business. If Linn had started in the US it would be a minimum of ten times bigger. We know that from how easy it has been to build our company in Florida. And there are firms starting in China just now that will quickly become 100 times bigger than us. “No-one has built a Sony or a Microsoft or a Nokia in Britain since the second world war. It’s a pathetic record. Even Israel, a tiny beleaguered nation, is building billion-euro manufacturing firms. Norway has its Kvaerner, and you can tell the same story about Holland or Belgium.” There is resignation, rather than anger, in what he adds. “The fact that somebody like us survives the battle doesn’t mean you haven’t lost the war. If only one of your soldiers is left standing, you have to ask: How long will it be before they get it too? “It’s true that if everyone else did what we did, Scotland would be better off,” he says. “People often ask why Scottish manufacturers couldn’t just re-jig and research and expand and compete. Some do. “But there’s too much aggro involved. People are simply not prepared to work as long and as hard and to the detriment of their social life and health as we have. “If instead of putting GBP 50,000 into Linn 30 years ago I’d bought a flat in Edinburgh, it would be worth around GBP 10m tax- free today. Why should people come and work for us, or build a business from the ground up, when they could do something like that? “We’re in a hot spot of decay and failure. We’re seeing companies in Scotland get mature and either fail or move their core production and intellectual property offshore. And yet we’ve got politicians running around saying don’t talk the country down.” If Tiefenbrun’s ambitions have been curbed, his passion for hi-fi still burns. “Some people spend GBP 10,000 or GBP 20,000 on a new kitchen or soft furnishings” he says. “They’re idiots. They miss out on a whole cultural dimension, a whole aspect of life. “When I lived in a two-up in Cupar for GBP 5 a week, and I came home one day with a GBP 675 hi-fi, my wife asked if I was mad. But there are categories of people who realise it’s a very serious purchase. “There are different markets, of course, even for us. Music at its most special and precious is a solitary and private experience. Whereas the home cinema we offer has to recognise that film and television is a social occasion; families or kids or friends. “What unites all these people, whether they spend GBP 1,200 on a Linn system or GBP 200,000, is that they care about sound quality. They know they can buy a GBP 69 DVD player. But they also know it’s c***.” The future for Linn is to follow the path it has always pursued. “The technologies develop and their cost comes down, but our strategy remains the same. Better sound, better operation, and better integration into your home. So you can start a movie, dim the lights, see who’s at the front door or watch a child in a bedroom, all at the push of a button. “We know the country is content to see our extinction as manufacturers. We’ve got to decouple ourselves from society and maintain the highest standards we can for Britain overseas.” 30-SECOND CV Who’s in your family? My wife, two sons and a daughter in their thirties; one grandchild, and one on the way. What book are you reading? Black Vinyl, White Powder, about the rock music business. Your desert island disc? Mendelssohn’s violin concerto. Your biggest business strength? I’m very persistent and stubborn. And your biggest business weakness? I try too hard. I should just let go sometimes. How much do you spend on a bottle of wine? Whatever it takes to buy something nice. Typically GBP 40-GBP 140. This entry was posted on Saturday, November 8th, 2008 at 5:24 am	and is filed under Go See. You can follow any responses to this entry through the RSS 2.0 feed. You can leave a response, or trackback from your own site.